A receipt featuring Lodge spark plugs in 1937. Homepage. 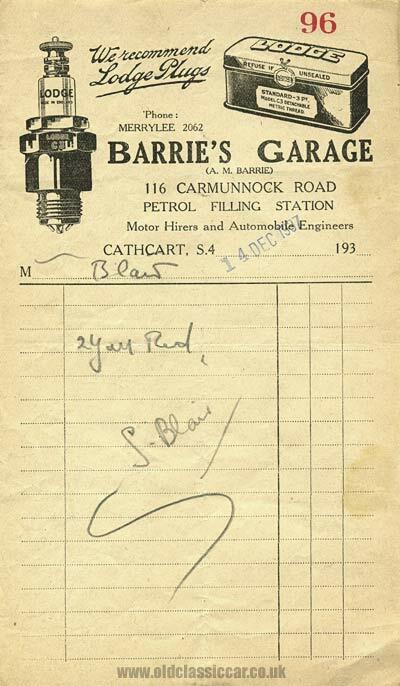 This page: A receipt issued by Barrie's Garage, of Carmunnock Road in Scotland, during the 1930s. Barrie's Garage - Lodge spark plug outlet. Barrie's Garage was located at the Petrol Filling Station, 116 Carmunnock Road, in Glasgow, Scotland. The proprietor was A.M. Barrie, and their trade was "Motor Hirers and Automobile Engineers". The receipt, issued to a Mr Blair on 14th December 1937, features illustrations of Lodge spark plugs, plus the slogan "We Recommend Lodge Plugs". A closer look at the illustrations reveal that the Lodge spark plug is a C3 type, while to the right is a small Lodge tin, also for the "Standard 3pt Model C3 Detachable - Metric thread". Coincidentally, an example of a Lodge C3 can be found on this page, within this section focusing on motor-related collectables at oldclassiccar. The C3 plug was introduced in 1929, and featured a mica-wrapped core installed around the central electrode. It soon found fame thanks to pioneer Australian aviator Sir Charles Kingsford Smith, who used Lodge C3 plugs during a record flight in 1929, from England to Australia. The aircraft was the "Southern Cross", a Fokker Trimotor. In 1935 he would disappear while attempting another record flight, this time to break the record for a flight between England and Australia in "Lady Southern Cross", a Lockheed Altair. His disappearance remains something of a mystery, although in 2009 news broke that the site of the crashed aircraft may have been located. Barrie's Garage was located at 116 Carmunnock Road - a search online brings up details of a firm called Manse Brae Service Station, located at 116, Carmunnock Rd, Kings Park, Glasgow, so perhaps it is the same location? More motor-trade related invoices and receipts can be found in the Motoring Collectables section of this site.